Troop 50 parents joined Scouts and leaders — at least for part of the weekend of May 19-21 — at Auburn’s Forest Ecology Preserve to plan for the 2017-18 troop year. Senior Patrol Leader Josh reviews with parents and leaders feedback from the Scouts' breakout session. of burgers and all the fixings. 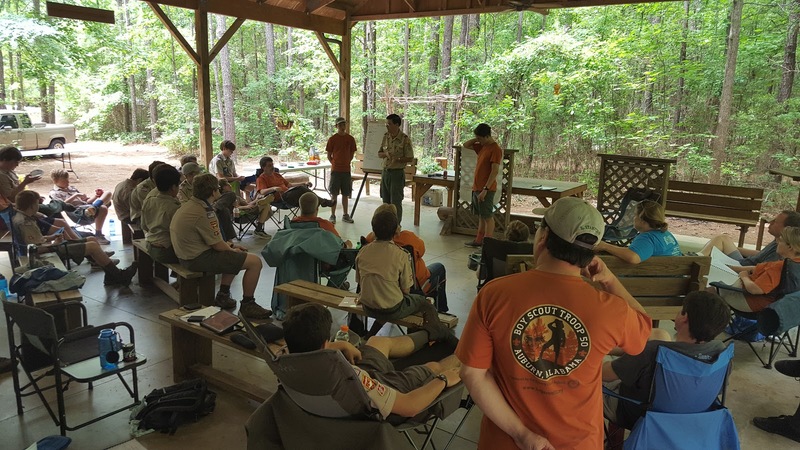 The troop’s annual planning retreat, held this year on Saturday, May 20, provides opportunities for parents, Scouts and leaders to have input into the troop’s ongoing operations and the types of events it schedules throughout the year. The retreat included separate breakout sessions for parents and Scouts. As Scouts discussed the types of monthly campouts and outings they wished to schedule for the upcoming troop year, parents and leaders reviewed calendar opportunities to schedule those activities, in addition to discussing various operational and membership matters. The group came together to review those discussions and to develop a tentative annual calendar. Leaders and parents also considered feedback from Scouts about positive aspects of the troop and matters or processes they’d like to see adjusted. 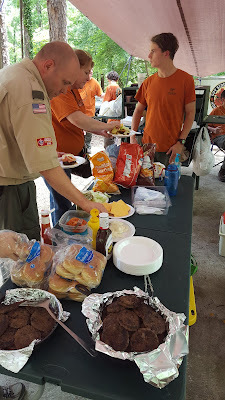 Following the retreat programming, everyone in attendance enjoyed lunch prepared by some of the troop’s senior Scouts. This gave everyone time for some fellowship, and for parents to see how their Scouts and the rest of the troop camp. After the parents departed the campsite for the day, Scouts and leaders performed a service project benefiting the preserve. They pruned back trees and cleared the overgrowth from the trail connecting the campsite with the preserve’s north parking lot. 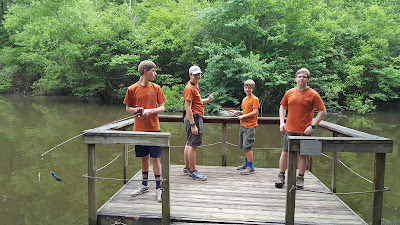 The group then broke into different activities, with some Scouts geocaching, some fishing, and others relaxing before the afternoon rains began. 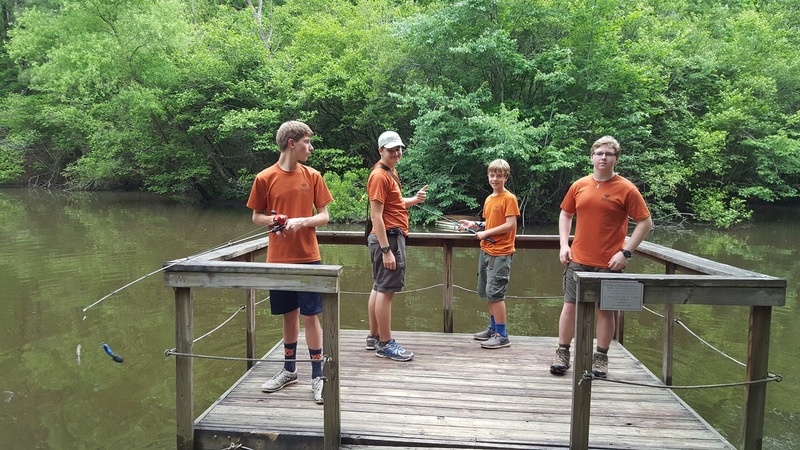 (Left to right) Joey, Jacob, Hunter and Nicky "test the waters" to see if the fish are biting! Patriots Patrol present their campout culinary cuisine. Light evening rains did not dampen the troop’s evening cooking efforts, which featured a friendly cooking competition between the two patrols — the likes of which rivaled the popular television show “Chopped.” Interestingly, the competition pitted brother against brother, with Armored Armadillos Patrol Leader Jacob presenting his patrol’s culinary concoction, and brother Michael doing the same on behalf of the Patriots. 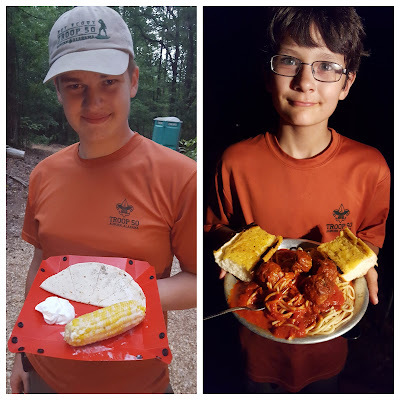 The Armored Armadillos prepared a dish featuring a grilled chicken quesadilla, dollop of sour cream and buttered corn on the cob. The Patriots offered a generous helping of spaghetti and meatballs and two pieces of garlic French bread. Adult leaders served as judges and assessed both taste and presentation, and promised to announce the winners after their samples settled in their stomachs (and, joking, the threat of food poisoning passed). Saturday evening’s rains persisted overnight, and at times were marked by thunder and lighting. The troop woke to soggy tents and some typical May humidity, but prevailed nonetheless. Following breakfast and packing gear, the troop gathered for its traditional Sunday morning campout devotional, which focused on Jesus’ retreat to the Garden of Gethsemane for prayer following the Last Supper, and how the troop’s retreat and our own quiet prayer time give us a chance to reduce the distractions of life and focus on matters of importance. The Forest Ecology Preserve was not the only place you could find Troop 50 Scouts and leaders in action that weekend. 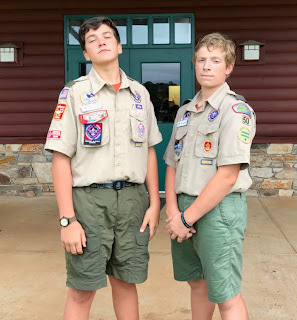 Scouts Creighton, Rusty and Liam, along with Assistant Scoutmaster Wes Williams, were at Chattahoochee Council's Camp Lumpkin readying for the upcoming National Boy Scout Jamboree. 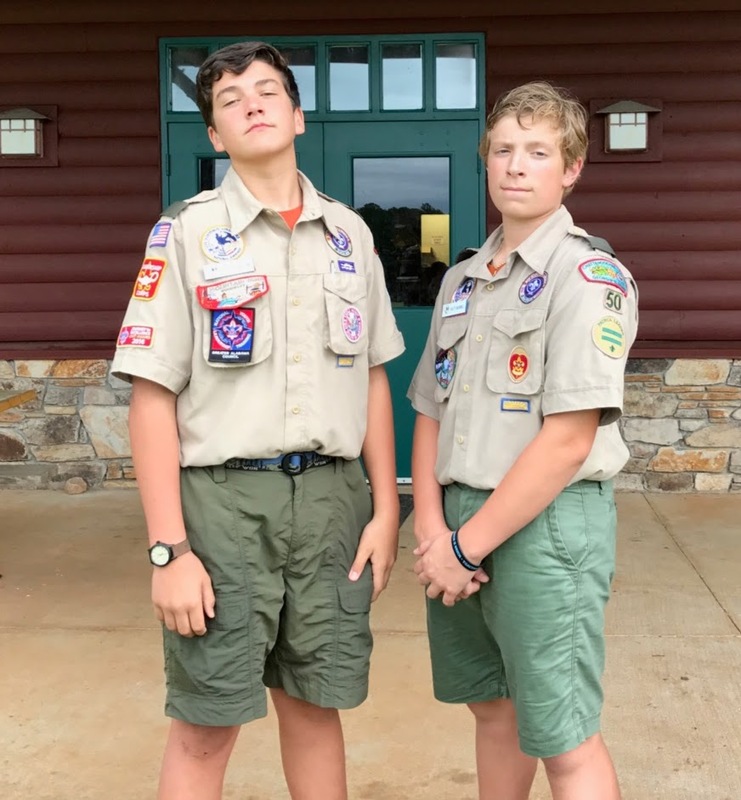 All three will join 40,000-plus Scouts at The Summit Bechtel Family National Scout Reserve in late July as part of the council's contingent. This weekend's "shakedown" provided members of the jamboree contingent a retreat of their own to prepare for the week-long national event. For more photos from the troop’s annual planning retreat, visit the troop’s online photo album.